The Government Manual is an essential guide to the United States Federal Government, where one can find the Declaration of Independence, the Constitution, and information on every U.S. Government agency. This official handbook on the Federal Government is published annually by the National Archives and Record Administration’s Office of the Federal Register. Two years ago, Government Book Talk featured the Government Manual with the post “Browsing the Government Manual”. 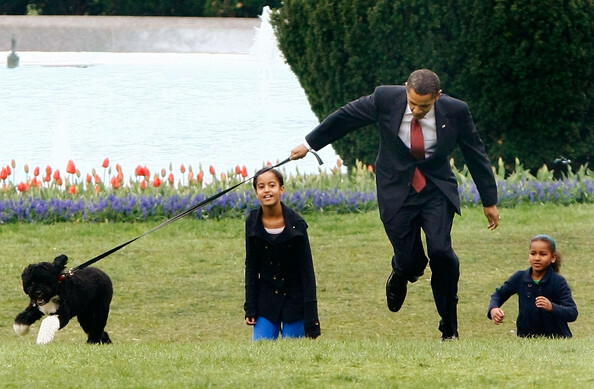 Here, we will take another look at this ultimate resource on the U.S. Government. Information on consumer activities, contracts and grants, employment, publications, and contact information. 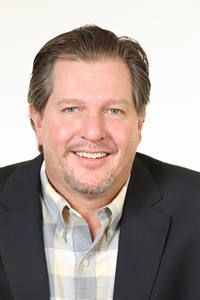 This organizational structure is beneficial for large executive branch agencies that have several departments each with their own mission and function. For example, 20 pages of the manual are devoted to the nearly 40 different divisions, offices, and bureaus that make up the Department of Justice, which seems complex but pales in comparison to the Department of Defense and its behemoth structure. The Government Manual concludes with the History of Agency Organization Structures. 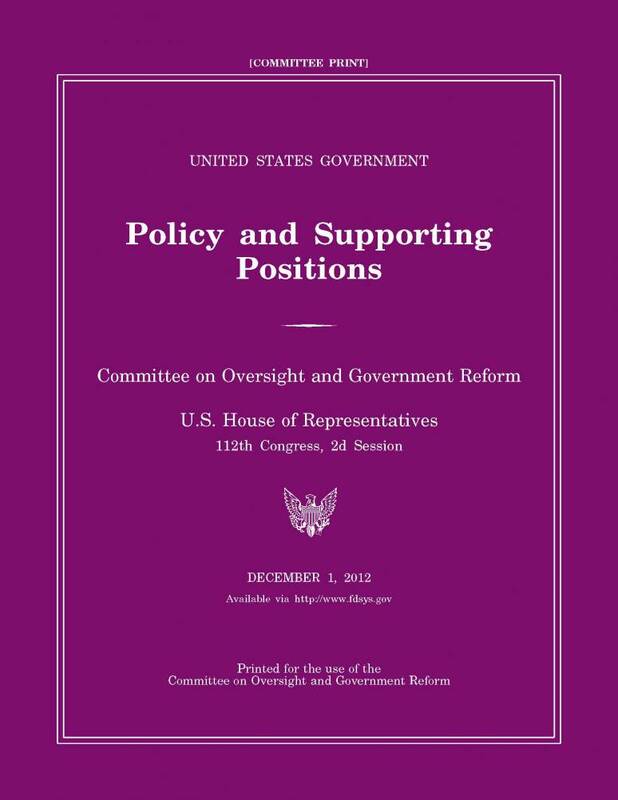 This section of the manual is arguably the highlight of this publication, as it provides a history of the lifetime and timeline of each agency as the U.S. Government grows with the country. For example, the Bureau of Immigration was created in 1891 as a branch of the Department of Treasury and cycled through to the Department of Commerce and Labor, the Department of Labor, the Department of Justice, and finally, after losing its name but keeping its functions, landed in the newly established Department of Homeland Security in 2002. The Government Manual is not only a great resource on the United States Federal government and its functions, but also a goldmine of new information and interesting facts that are not commonly known about the U.S. Government and the country’s history. So, if you would like to understand how the U.S. Government is organized, then this is the book for you! How can I get a copy of “The United States Government Manual 2013”? 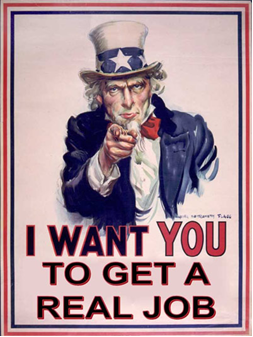 clicking here to browse all Government Directories and Organizations publications. About the Author: Our guest blogger is Emma Wojtowicz, Public Relations Specialist in GPO’s Office of Public Affairs. Additional content provided by Stephanie Jaeger, Sales & Marketing Coordinator for GPO’s Sales & Marketing Division and is responsible for marketing GPO’s publishing services to the Federal sector. Holding a job vs. having a career. Making a living vs. following your vocation. In today’s tough economic climate, many unemployed or underemployed would be happy with any job, and don’t dare aspire to a dream job. 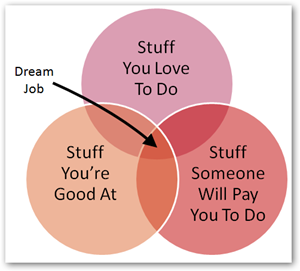 But what if you could have it all: a job that you love to do, you’re good at doing it, and is in demand so you will actually get paid to do it? In President Obama’s State of the Union Address this week on Tuesday, February 12, 2013, one of the themes was the need for education and job training (and re-training) to help get Americans into the workforce or transition into more stable industries. But half the battle is knowing which profession matches your passions and talents, what skills and education you need to carry out that job, and what the current and future prospects are for that particular field so you have a better chance at keeping that job in the future. Fortunately, the U.S. Department of Labor’s Bureau of Labor Statistics (known as BLS) has two complementary publications to help you choose the right career path. 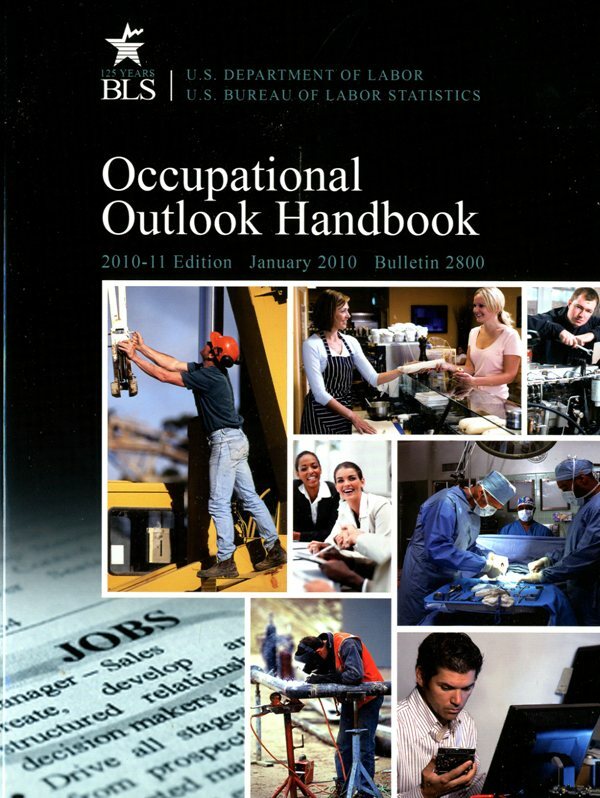 The Occupational Outlook Handbook is the Federal Government’s premier source of career guidance featuring hundreds of occupations—both blue-collar and white-collar— from carpenters, firefighters and sports referees to teachers, medical professions, personal financial advisers, and even multimedia designers and scientists. Revised every 2 years, the latest version contains employment projections for the 2010-20 decade. Do you “dig” bones and ancient cultures? Read up on archeologist careers and learn their most recent media pay, entry-level education requirements or equivalent work experience, the number of jobs in this field today and the job outlook for this field over the next decade. Currently, the top two fastest growing occupations are personal care aides and home health aides, to serve the aging baby boomers. The HGTV home renovation effect seems to have been a boon for tile/marble setters and stone and brick masons, and our nation’s kitty and puppy love for pets has made veterinary techs in high demand. The highest paying of the top 20 fastest growing occupations are physical therapists at $76,310 median annual pay and biomedical engineers at $81,540. 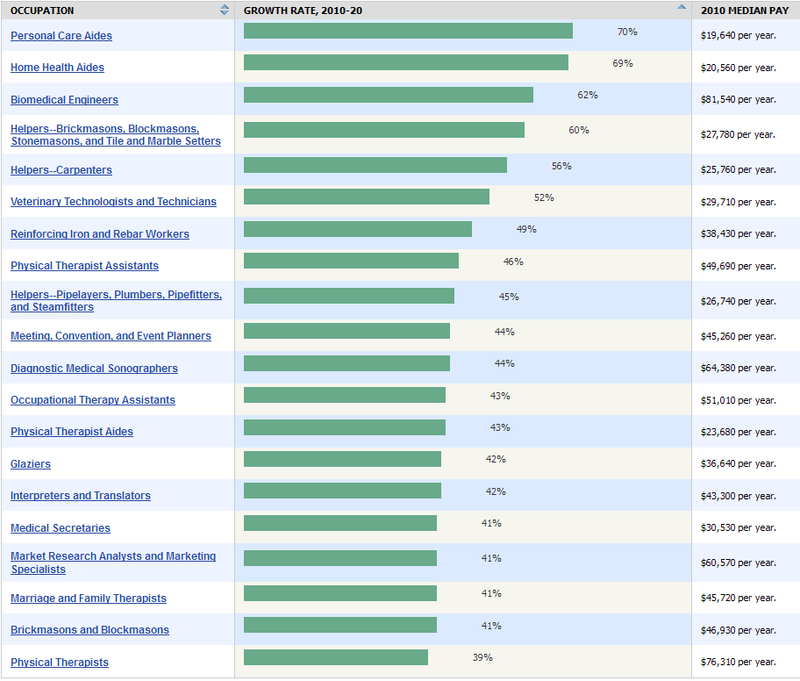 Image: Fastest growing occupations: 20 occupations with the highest percent change of employment between 2010-20. 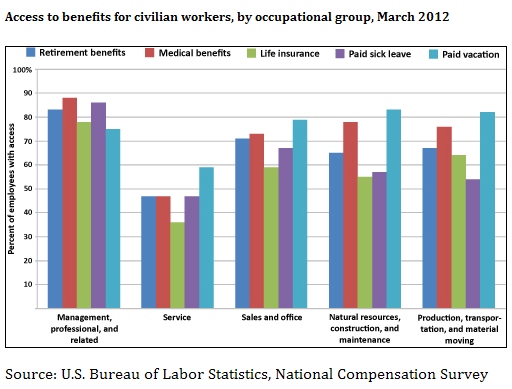 Source: U.S. Department of Labor Bureau of Labor Statistics (BLS). For those who want more regular updates with more in-depth articles, the Bureau of Labor Statistics (BLS) also offers its attractive magazine, the Occupational Outlook Quarterly, or the “OOQ” for those in the know. Suitable for job-seekers, students, teachers, parents, job and guidance counselors, this color magazine format features personal stories and detailed articles describing insiders’ views of what different jobs are like. 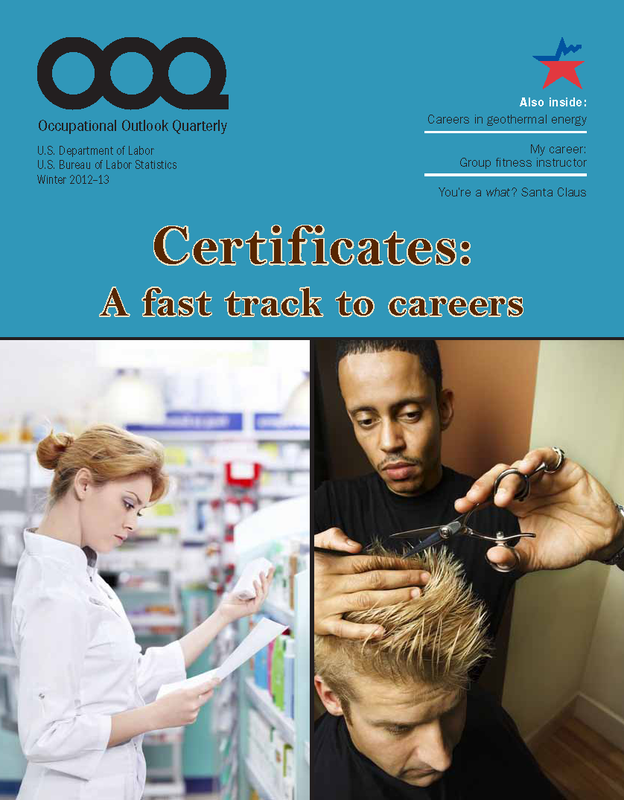 In the Winter 2012-13 edition of the OOQ, the feature article explained what certificates and certificate programs are, the differences between certificates and licenses or degree programs, and how certification might offer a quick way to enter a career. Another described the “hot” field of geothermal energy (pun intended) and the various careers to take advantage of this growing industry. Other articles provide tips for online resources for comparing colleges and available scholarships, life in the real estate or personal fitness professions by successful people in these occupations, and which types of careers tend to offer the best benefits and job perks. Have a hankering to turn your “ho-ho-ho” into more than a hobby? The OOQ even included a fun article entitled “You’re a what? 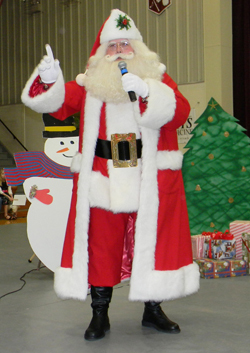 Santa Claus!” describing the jolly job of Phil Wenz who became a professional full-time Santa Claus and Santa historian at a Christmas theme park in Illinois. How can I buy these Occupational Outlook publications? You are currently browsing the archives for the Department of Labor category.